It was on this day 285 years ago, in 1733, that France declared war on their cruel ruler, emperor Charles VI – something I’m sure Forrest had in the back of mind when approaching this imperative game. It was a mild day at Peffermill, and whilst it was disappointing that Edinburgh University themselves couldn’t show up, it was nice of them to let their little brother Heriot Watt play. The levels of anticipation around the pitch were visibly tangible, especially as this was a cup game. The Saints knew Heriot Watt would be a decent outfit, however with a star-studded line-up including big name players, and BNOCs alike, Snitch and Hardie making an appearance in the midst of deadlines – the Saints were ready for the game ahead. It was a slow start for the Saints, feeling the pressure early from a high pressing Heriot Watt. However, an intercepted pass in midfield let the attackers break quickly and Fulton was set up nicely for a straight strike from the top of D, which was finished nicely to make it 1-0 to the Saints. The tables had turned in the favour of the Saints and they become dominant in the coming 15 minutes, with little threat from Heriot Who? Two shots from the Saints came soon after, and a blistering half volley from Geordie from the top of the D sent the keeper into dismay – not even realising he had saved the ball and losing sight of it as it pinged off his left arm. 22 minutes in and the Saints had won their first short corner, giving it quickly to Hardie on left slip who fired it into the mixer, however this attempt only asked for a simple kick out from the keeper, and the danger was cleared. The pressure from the Saints was too much for Heriot Where? to handle, and shot after shot was fired just wide of the post. There were but a few dragging minutes before half time, and Hardie decided that he’d had enough of eyeing up the birds playing on the other pitch, and that it was time he played some actual hockey. A tackle on the half way line, and Hardie was off, dodging past players almost as well as he dodges pints on a Wednesday evening – a bit of flair and he’d already got past 4 opposing defenders, leaving him top D to have a straight strike and place one in the bottom corner, however their keeper had other ideas, pulling out a lunging save to keep Hardie off the score sheet – for now. This left the Saints with but a one goal lead, going into the second half. An inspiring half time team talk from Adshead left the Saints geared up for a tasty second half performance. The pressure from the Saints continued into the second half, and Heriot Where? were feeling it, with ball being in and around their D a multitude of times – just how Freud likes it. However, it took some time before the Saints bagged their second goal – coming in the form of a short corner, after Hardie was hit for 6 by the outstretched leg of the Watt keeper. The ball was slipped once again to Hardie, however this time he was loitering on the right, keeping Watt on their toes – and this time he decided to hit the ball around the keeper and not at him, placing the ball near post past the outstretched keeper, 2-0 to the Saints. It seemed as though the game was secured for the Saints, with few attempts in the D coming from Heriot Why? However, Watt had one more trick up their sleeve, with less than 10 minutes to go, a quick break from an intercepted ball, lead to the winning of a short corner and the best opportunity they had at scoring all game. 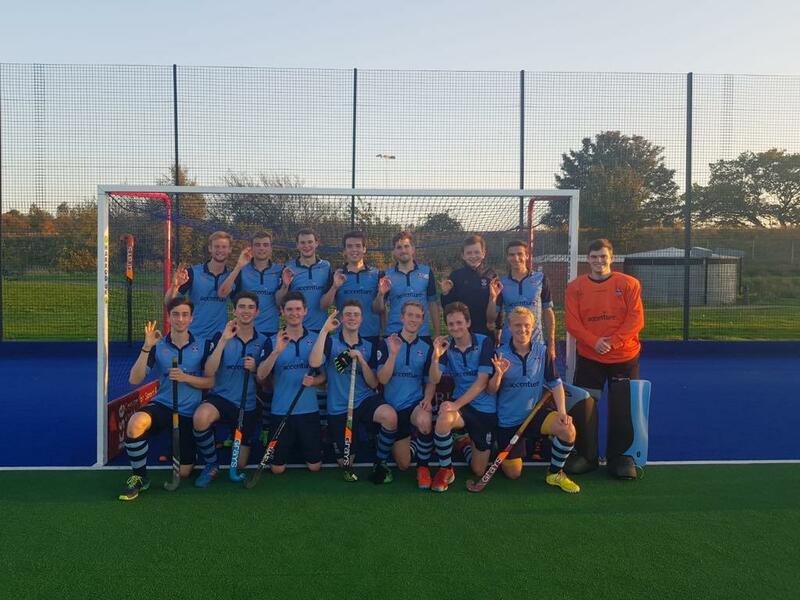 A quick injection and a straight flick from the top of the D, proved too much for fresher Kellogg’s in goal, as the ball ended up in the back of the net, even if it did take a touch off the keeper’s outstretched, left leg. The pressure was on for the Saints, however, smart hold up play and passing around the back lead them to sail to an easy finish. The final whistle was blown, and the score – 2-1 to the boys in blue, unbelievable Jeff. All in all, a good day for the Saints, a win away in Edinburgh, and almost two thirds of the team made it out – the flaming giraffes are ready for their cup run.